Tidal, the high-definition music streaming service acquired by rapper and music mogul Jay-Z, is gearing up for its official relaunch under new ownership today, and it will be doing so by reportedly making a move to snag new releases by some of the biggest musicians of the moment including Kanye West, Madonna and Daft Punk, ahead of rival services like Spotify and Beats. The company has been sending out invites for a press conference being held at 5pm Eastern time today, in which Shawn “Jay-Z” Carter “will announce a commitment to a new direction for the music industry from both a creative and business perspective.” While there is not much detail being provided officially, unofficially we’ve heard that the company will be using the event to confirm the first big-name artists to stream music exclusively on the Tidal platform. What might those artists be doing on Tidal? Not an ordinary streaming deal, it seems. Over the weekend, the Swedish blog Breakit reported — citing sources close to the deal — that Tidal’s plan of attack will be to ink first-window deals with the artists, where Tidal would get first releases of tracks from big-name artists ahead of any other digital streaming services. This would be exclusive, but only for a period: Spotify, Deezer and others would eventually also get these tracks, but only later. It would also follow on the heels of Taylor Swift’s catalog coming to Tidal last week — minus her 1989 album. This is not an exclusive deal but lays the groundwork for other Swift music to make its way to Tidal first. What’s the pull for these artists? It’s partly the Jay-Z connection. His Roc Nation agency works with a long list of musicians to provide publishing, management, label and other services, with Tidal becoming yet another string on Roc Nation’s bow as a one-stop music distribution shop. On the other hand, from what we understand, Tidal is also offering a more attractive set of terms to musicians than other streaming services — often agreeing to payouts of twice as much as its rivals. 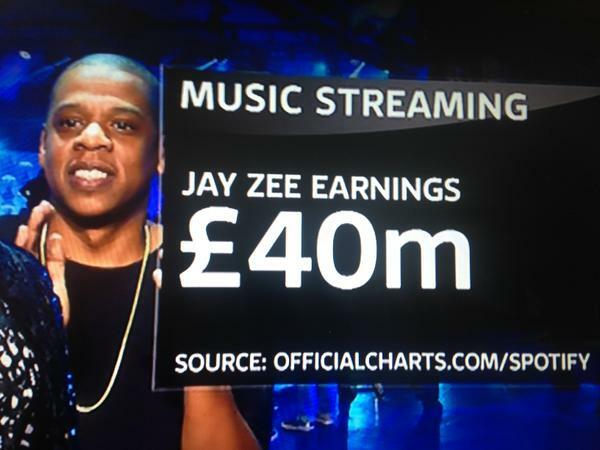 With many artists complaining that digital music is not providing decent enough returns, the later of these could be a deal maker for Tidal. The big question is whether artists are willing to make the bet on payouts-per-stream over that of visibility: right now Tidal has only 35,000 subscribers paying $19.99 per month across the markets in which it is active, which include the U.S. and UK. By comparison, Spotify noted 15 million paying subscribers in January of this year. Tidal also offers a standard definition service at $9.99.